Location - Dresdner Parkeisenbahn e.V. "Home" > "The Park Railway" > "Location, Public transport, Parking and Contact Information"
Click on the plan to enlarge! 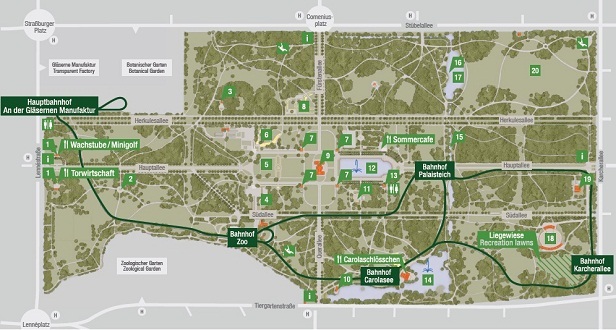 The Park Railway Dresden is located in the park "Großer Garten", in the city centre of dresden. Follow the signs for zoo and the factory "Gläserne Manufaktur" in the city center of Dresden, to get to the Great Garden. Tiergartenstraße - Many parking areas along the street.